Accused of a Washington State drug or VUCSA crime? As you may have already discovered, accusations of Washington State drug or VUCSA crimes are taken very seriously by law enforcement, prosecutors, and the courts. In addition to potential jail time and fines, a conviction for a Washington State drug or VUCSA crime will have serious long term consequences. VUCSA Drug Defense Lawyers in Seattle, Washington State. We understand after you have been arrested for a Washington state drug charge or VUCSA charge you may have feelings of despair, hopelessness, and even anger. We are here to tell you that there is hope that your charge will be successfully resolved and even more importantly, that you will make it through this period. Know what you can today matters. We have designed this web site to try and answer every Washington VUCSA or drug crime question that you may have. We did this because we know that knowledge is power and we wanted to give you back some of the power that you may feel you have lost from your arrest. We would like the opportunity to meet with you and discuss your Washington VUCSA related case. Jail alternatives may include drug court or DOSA. Convictions may lead to loss of federal funding – including school loans. Penalty enhancements for firearms present, protected zone, presence of a child, sale to a minor & correctional facility sale. Penalties can be from a misdemeanor to felony. We would like to help you fight your Washington state drug and VUCSA charge, such as possession of marijuana, cultivation of marijuana, possession of a controlled substance, delivery of marijuana, delivery of a controlled substance or any other drug related charge you may be facing. Please call us so that we may do that. We are passionate about our work and will be doing it for years to come. We have helped people who are in a similar situation as yours fight their Washington State VUCSA and drug charges. We have had great results, with many people having their Washington drug and VUCSA charges properly handled. We meet with you in our office, for free and for as long as it takes. We like to do this initial consultation in person (not over the phone) because this is the best way to hear about your case and give you legal advice. There is simply no substitute for a face to face meeting. Provide you with a "game plan" in the form of a list of things to do to help you resolve your Washington State drug charges in the best possible manner. Based upon feedback from our clients, it appears that we are living up to these goals and are committed to doing so in the future. If you decide that one of us is a good fit to work with you on your Washington drug case (it is your choice who you work with and promise not to hard sell you, we only want to work with people who want to work with us) then we will begin representing you in your Washington State drug charges. We represent people all over the state on drug related cases, but most often in King, Pierce and Snohomish Counties. Being there to “hold your hand” throughout the entire process – beginning to end, in court, in the office, and over the phone. * I feel proud in saying that I regularly receive these. I have been recognized as a "Super Lawyer" by my peers in Washington Law and Politics Magazine. * I am actively involved as a Legislative Liaison for the Washington Association of Criminal Defense Lawyers. In this role I have written, lobbied for and passed three laws that help people accused of crimes in Washington State. * In 2001 I graduated from Gerry Spence's Trial Lawyers College - an intensive training program where we learned trial skills from some of the best litigators in the country. * Quoted in CBS News published article. As our paralegal, Ana helps us stay organized and on time. 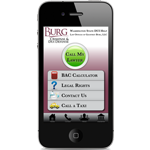 She is the person who greets you on the phone and helps with many of the details of your case. While we try and speak to you in person when you call, if we are in court, Ana is the one who will make sure your questions are answered.